On the University of South Florida campus you will find many attributes to public art and the arts themselves, none more mesmerizing than the piece Solar Rotary by Nancy Holt. 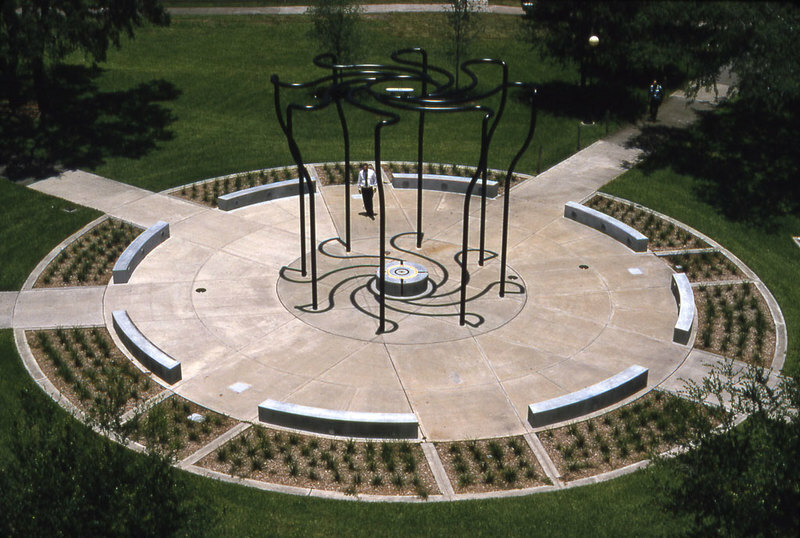 On the University of South Florida campus you will find many attributes to public art and the arts themselves, none more mesmerizing than the piece Solar Rotary by Nancy Holt made in 1995, located by the Communication and Information Sciences building. This piece of art is not only a beautiful master piece but it is masterfully put together with thought and intention, it includes wonderfully integrated pieces of history of not only the campus but of the state and city. It is truly a sight to see, whether you are into art and sculpture or if you are simply into history and the history of Florida, this is a great place to visit, sit, and enjoy the weather and take some really cool photographs. 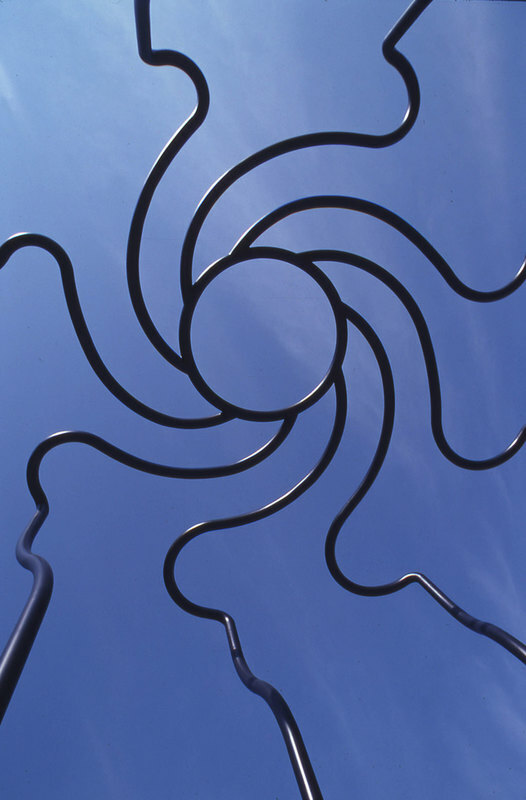 The eight tendrils extend out from a central ring and trickle down to the ground; but not only is this sculpture beautiful and intricate; it also contains a history lesson and cool aspects that are connected to the university itself. The large ring on the central circular seat is inscribed with this statement: “On the day of the summer solstice at solar noon between 1:31 and 1:32 pm a circle of sunlight will be cast around this circular seat”. In the center there is a meteorite that is said to be 4.5 billion years old that was found in Dade County, Florida. On five specific days of the year and at a specific time, the sculpture casts a ring of light around different plaques placed in the ground of the plaza that highlight certain important points in Floridian history. It highlights several important dates including : March 27th at 12 :18pm, the date of the first sighting of Florida by Ponce De Leon, August 14th at 3 :30pm, the date that the first map of the coast of Florida was submitted to Lord Hillsborough in 1772, January 25th at 12:12pm, the date of the establishment of the first town government of Tampa in 1849, September 5th at 4:11pm, the date for the groundbreaking ceremony for the University of South Florida in 1958, and July 29th at 10:24 am, the date that Apollo 11, that launched from Cape Canaveral, Florida, landed astronauts safely on the moon. Also within the dedication plaque is sand from all four corners of the campus and the plaque states, “Sand from the four corners of the University (NE, SW, NW, SE) was used in the making of the circular seat.” There are also eight concrete benches set around the plaza that have three circular lights for nighttime lighting and illumination.Four concrete benches with N, E, S, and W inlaid in bronze are approximately 65 ft. from the center of the plaza in the North, East, and South and West directions. They are under trees, shaded from the sun, and extend the sculpture into the surrounding landscape. The openings between the vertical posts of Solar Rotary are aligned with the central axis formed by the converging sidewalks through the center of the paved circle in an eight pointed star pattern (symbol for Venus). 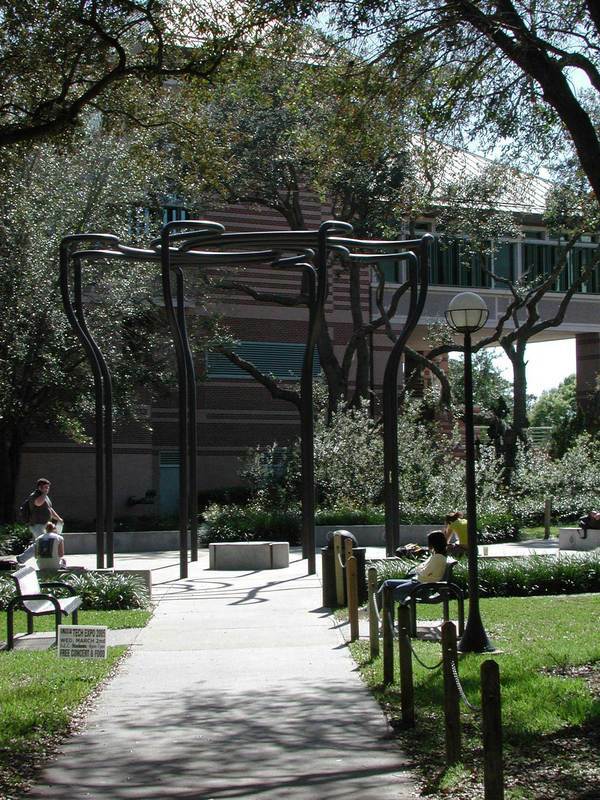 This is not only a piece of public art but a piece of public history that is proudly displayed at the University of South Florida; showing that Tampa is a city that is proud of it’s history and is also proud of it’s art and is a supporter of the arts as well. 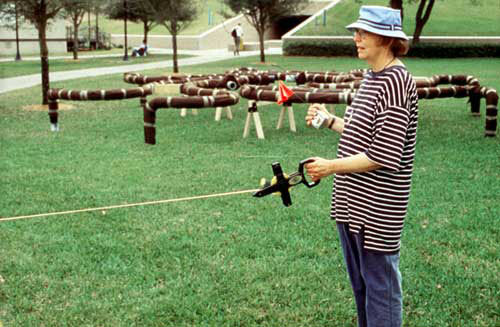 Angelica Berrojo, “Solar Rotary by Nancy Holt,” Tampa Historical, accessed April 20, 2019, http://tampahistorical.org/items/show/52.